Currently, liquid chromatography-mass spectrometry (LC-MS) is one of the most important analytical technologies for detecting hundreds of metabolites in the field of metabolomics. A recent advance in LC that has impacted metabolomics is the development of UPLC (ultra-performance liquid chromatography). 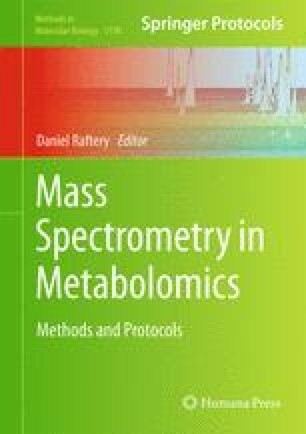 In this chapter, we describe the analytical methodologies for the global metabolic profiling of serum, urine, and tissue samples using UPLC-Q-TOF (quadrupole-time-of-flight)-MS. Aqueous metabolites are extracted after adding methanol/acetonitrile/acetone and then analyzed by UPLC-MS under positive and/or negative ionization mode. With the aid of multivariate statistical analysis, separation between various groups can be observed in the score plots, and biomarkers are screened in the loading/weight/VIP (variable importance in the projection) scatterplots. Furthermore, putative markers can be identified through comparison with the authentic standards based on tandem mass spectrometry (MS/MS) fragmentation pattern and LC retention. We expect that our protocol, with modifications if necessary, can be useful in many metabolomics studies and a wide range of research areas related to small molecules and LC-MS. This work was supported by the National Science and Technology Major Project of the Ministry of Science and Technology of China (2013ZX09103-001), the National Natural Science Foundation of China (No. 21365001), the Chinese National Instrumentation Program (No. 2011YQ170067), and Li-Shi-Zhen Young Scientist Project of School of Pharmacy at the Second Military Medical University, Shanghai, China.